Dasatinib is a novel, potent and multi-targeted inhibitor that targets Abl, Src and c-Kit, with IC50 of <1 nM, 0.8 nM and 79 nM in cell-free assays, respectively. Antitumor activity (A)and body weight (B) relationship for BLU-285 and dasatinib in a P815 KIT D814Y mastocytoma allograft model. Science, 2017, 9(414), doi: 10.1126/scitranslmed.aao1690. Dasatinib purchased from Selleck. Combinational treatment of kinase inhibitors induces the similar phenotype produced by PP1. All images are lateral view with dorsal to the top and anterior to the left. The combinational treatment of Dasatinib (D) or U0126 (U) with Sunitinib (SU),PTK787 (PTK), or ZM323881 (Z) resulted in the shrinkage of dorsal aorta. Cell Res 2011 21, 1080-1087. Dasatinib purchased from Selleck. Cytotoxicity by Dasatinib and Nutlin-3 used alone or in combination in B-CLL patient leukemic cells. B-CLL patient leukemic cells were exposed to serial doses of Dasatinib or Nutlin- 3 used either alone or in combination, with a fixed ratio, for 48 hours. Dose-effect plots, to determine drug efficacy, are shown for representative B-CLL samples, including 3 patients carrying 17p- (Pt. #7, Pt. #8, and Pt. #10). The decrease of cell viability, labeled "effect" on the Y-axis, was determined in assays done at least twice in duplicate. Clin Cancer Res 2011 17, 762-770. Dasatinib purchased from Selleck. Dasatinib interferes with the p53 transcriptional activity induced by Nutlin-3. Leukemic cell lines were exposed for 24 hours to Dasatinib (10 μM) and Nutlin-3 (10 μM), used either alone or in combination, as indicated. Levels of p53 (A), MDM2 and p21 (B) were assessed by Western blot analysis of total cell lysates. Representative examples of Western blot results are shown. Tubulin staining is shown as loading control; after densitometric analyses, p53 as well as MDM2 and p21 protein levels are expressed as folds of protein modulation, by the indicated treatments, with respect to the control untreated cultures set to 1 (hatched line). *P < 0.05 with respect to the Nutlin-3-treated cultures. Role of Akt in Dasatinib cytotoxicity and in DasatinibtNutlin-3 synergy. A, whole cell lysates were prepared from EHEB and BJAB cell lines treated (for 16 hours) as indicated, and hybridized with a human Phospho-Kinase array kit. Spot densities of phospho-proteins were quantified using Image Quant TL software and normalized to those of positive controls (set at 100) on the same membrane. The analysis of modulation of phosphorylation signals for P-ERK1/2, P-p38, and P-Akt are reported (*P < 0.05). Validation of phospho-kinase array results was carried out by Western blot analysis of P-Akt levels. Impact of the TKI erlotinib, lapatinib, dasatinib, and sorafenib on the viability of MDS/AML cells. MOLM-13 (A) and HL-60 (B) cells were incubated with the indicated doses (given in mM below the x-axis) of the 4 TKI, and cellular viability was assessed by MTT assay after 24, 48 and 72 h of incubation. Changes in viability are given as percentage of cells as compared to non-treated control samples. This experiment was repeated at least three times, yielding comparable results. Graphs show representative results of one experiment carried out in duplicates (mean standard deviation). Biochem Pharmacol 2011 82, 1457-1466. Dasatinib purchased from Selleck. Capacity of the TKI to overcome the AML-typical differentiation blockage. The myeloid cell lines MOLM-13 and HL-60 were incubated for 6 days with 0.01% DMSO (serving as a negative solvent control), 1 μM of ATRA (serving as a positive control), as well as with the indicated doses of the four TKI. (A) Representative May -Gruenwald -Giemsa staining of MOLM-13 cells, (B) quantitation of the percentage of MOLM-13 cells exhibiting at least two morphological signs of differentiation (that is a decrease in cytoplasmic basophilia, a reduction of the nucleo-cytoplasmic ratio, appearance of nuclear lobulation and/or cytoplasmic granules). Percentages were evaluated by examining at least 100 cells/condition; (C) representative FACS overlays of MOLM-13 cells depicting TKI-induced CD11b expression (black line) as compared to the isotype (shaded grey); (D) quantitation of TKI-induced CD11b-expression in MOLM-13 cells; (E) representative slides depicting morphology/staining of MOLM-13 cells assessed in the NBT-reduction assay; (F) respective quantitative assessment demonstrating the NBT-reducing capacity under the different drugs; (G) representative May-Gruenwald-Giemsa staining of HL-60 cells. Cytotoxicity by Dasatinib treatment in leukemic cells.Leukemic cell lines were exposed to Dasatinib (10 μM). Upon treatment, cell viability (a) was calculated as percentage with respect to the control vehicle cultures (set to 100% for each cell line) and induction of apoptosis (b) was calculated as percentage of Annexin V+/PI+ cells after 48 h of treatment. Invest New Drugs 2010 30, 417-422. Dasatinib purchased from Selleck. Human phospho-kinase array analysis in response to Dasatinib treatment. Whole cell lysates were prepared from EHEB (p53wt) and BJAB (p53mut) B cell lines, either left untreated or exposed to Dasatinib for 24 h, and hybridized with a human Phospho-Kinase array kit. Spot densities of phospho-proteins were quantified using Image Quant TL software and normalized to those of positive controls on the same membrane. In a, intense decreases of signal of P-p38, PERK1/2 and P-CREB in response to Dasatinib are indicated by arrows in the membranes, and intensity of corresponding spots are reported as graphics. In b, analysis of modulation of phosphorylation of STAT family members in response to Dasatinib (spots not shown). The means±SD of three independent experiments are shown. Asterisk indicates P<0.05 against untreated. Effect of dasatinib on endothelial cell actin fiber organization. Subconfluent human microvascular endothelial cells‐1 were treated with dimethyl sulfoxide (A) or dasatinib (B), fixed, permeabilized and stained with phalloıdin (green) for F‐actin or FAK (red) for adhesion plaques. Images were taken in a confocal microscope (1000X). Cancer Med, 2017, 6(4):809-818. Dasatinib purchased from Selleck. Inhibition of cell growth upon culturing of primary bone marrow cells from an EMS patient and a healthy control in presence of TKIs in vitro. EMS cells showed reduced cell growth compared to the healthy control cells when cultured with ponatinib, dovitinb or dasatinib. Cell growth was evaluated after 72 hours in culture. All samples were normalized to DMSO controls. Non-linear regression curves were fitted for evaluation of IC50 values. Error bars represent mean values and standard deviation of the analyzed replicates. Eur J Haematol, 2017, 99(5):442-448. Dasatinib purchased from Selleck. Cell vability test result. Different cell lines (A2C12, Beta D5, Gamma A3, Gamma D12, A549, CaCo2,Hep G2) were treated with different concentration of Dasatinib. Dr. Thomas Kruwel of Fraunhofer-Institute for Toxicology and Experimental Medicine-Dasatinib (BMS-354825) purchased from Selleck. Dasatinib purchased from Selleck. Kinase assays using wild-type and mutant glutathione S-transferase (GST)-Abl fusion proteins (c-Abl amino acids 220-498) are done. GST-Abl fusion proteins are released from glutathione-Sepharose beads before use; the concentration of ATP is 5 μM. Immediately before use in kinase autophosphorylation and in vitro peptide substrate phosphorylation assays, GST-Abl kinase domain fusion proteins are treated with LAR tyrosine phosphatase. After 1-hour incubation at 30 °C, LAR phosphatase is inactivated by addition of sodium vanadate (1 mM). Immunoblot analysis comparing untreated GST-Abl kinase to dephosphorylated GST-Abl kinase is routinely done using phosphotyrosine-specific antibody 4G10 to confirm complete (>95%) dephosphorylation of tyrosine residues and c-Abl antibody CST 2862 to confirm equal loading of GST-Abl kinase. The Dasatinib concentration range is extended to 1,000 nM for mutant T315I. These same inhibitor concentrations are used for the in vitro peptide substrate phosphorylation assays. The three inhibitors are tested over these same concentration ranges against GST-Src kinase and GST-Lyn kinase. Ba/F3 cell lines are seeded in triplicate and incubated with escalating concentrations of Dasatinib for 72 hours. Proliferation is measured using a methanethiosulfonate-based viability assay. IC50 and IC90 values are reported as the mean of three independent experiments done in quadruplicate. 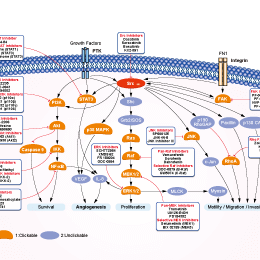 The inhibitor concentration ranges are 0 nM to 32 nM (Dasatinib). The Dasatinib concentration range is extended to 200 nM for mutant T315I. O'Hare T, et al. Cancer Res. 2005, 65(11), 4500-4505. Shah NP, et al. Blood, 2006, 108(1), 286-291. Chan CM, et al. Clin Cancer Res. 2012, 18(13), 3580-3591. Dargart JL, et al. Antiviral Res. 2012, 95(1), 49-56.
what’s the difference between S1021 and S7782? Which one is better for in vivo studies? Usually, hydrate will be more stable and dissolve better than free base. But this compound (S1021) dissolves better in DMSO than hydrate one (S7782). Can I give dasatinib to mice by oral gavage? If so, how to dissolve the drug? Our S1021 Dasatinib in 1% DMSO+30% PEG 300+1% Tween 80 at 30 mg/ml is a suspension which you can administrate to mice via oral gavage. If you want a clear solution, it can be dissolved in 4% DMSO+30% PEG 300+5% Tween 80+ddH2O at 5 mg/ml clearly. Saracatinib (AZD0530) : Pan-Src inhibitor, IC50=2.7-11 nM for c-Src/c-Yes/Fyn/Lyn/Blk/Fgr/Lck. Bosutinib (SKI-606) : Approved by FDA for Ph+ chronic myelogenous leukemia (CML). PP1 : Potent and selective Src inhibitor for Lck/Fyn with IC50 of 5 nM/ 6 nM. KX2-391 : The first clinical Src inhibitor (peptidomimetic class) that targets the peptide substrate site of Src, with GI50 of 9-60 nM in cancer cell lines. 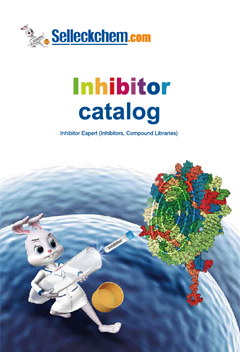 Dasatinib Monohydrate is a novel, potent and multi-targeted inhibitor that targets Abl, Src and c-Kit, with IC50 of <1 nM, 0.8 nM and 79 nM, respectively. SU 6656 is a selective Src family kinase inhibitor with IC50 of 280 nM, 20 nM, 130 nM, and 170 nM for Src, Yes, Lyn, and Fyn, respectively. PX-478 2HCl is an orally active, and selective hypoxia-inducible factor-1α (HIF-1α) inhibitor. Phase 1. Saracatinib (AZD0530) is a potent Src inhibitor with IC50 of 2.7 nM in cell-free assays, and potent to c-Yes, Fyn, Lyn, Blk, Fgr and Lck; less active for Abl and EGFR (L858R and L861Q). Phase 2/3. Features:The 1st Src inhibitor to show inhibition of the Src pathway in human tumor tissue. Bosutinib (SKI-606) is a novel, dual Src/Abl inhibitor with IC50 of 1.2 nM and 1 nM in cell-free assays, respectively. KX2-391, the first clinical Src inhibitor (peptidomimetic class) that targets the peptide substrate site of Src, with GI50 of 9-60 nM in cancer cell lines. Phase 2. PP1 is a potent and selective Src inhibitor for Lck/Fyn with IC50 of 5 nM/ 6 nM. PP2, a Src family kinase inhibitor, potently inhibits Lck/Fyn with IC50 of 4 nM/5 nM in cell-free assays, ~100-fold less potent to EGFR, inactive for ZAP-70, JAK2 and PKA. WH-4-023 is a potent and orally active Lck/Src inhibitor with IC50s of 2 nM and 6 nM in cell-free assays, respectively. Exhibits >300-fold selectivity against p38α and KDR. Also potently inhibits SIK (IC50 values are 10, 22 and 60 nM for SIK 1, 2 and 3 respectively) and displays selectivity over a range of closely related kinases. Ibrutinib (PCI-32765) is a potent and highly selective Brutons tyrosine kinase (Btk) inhibitor with IC50 of 0.5 nM in cell-free assays, modestly potent to Bmx, CSK, FGR, BRK, HCK, less potent to EGFR, Yes, ErbB2, JAK3, etc.